"Ahhhquatennial-- Fifty Fabulous Years," by John Baule. In Hennepin County History, vol. 48, no. 3 (Summer 1989): pp. 23-27. 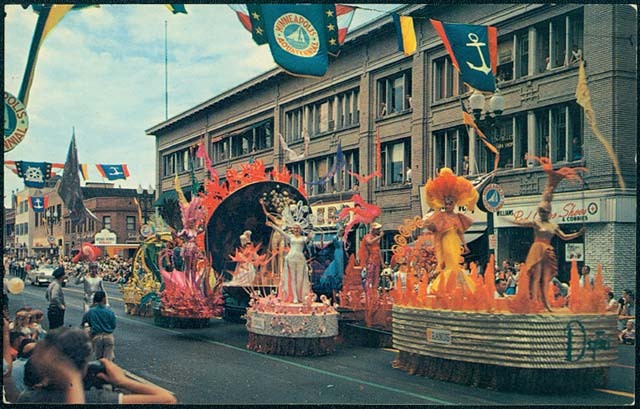 This collection contains the records of a voluntary association that planned and staged the Minneapolis Aquatennial, spanning the years 1940-1990. A bound collection of the yearly newsletter published by the Minneapolis Aquatennial Association. Summary Views of parade floats for the Aquatennial, Minneapolis, Minnesota’s annual summer celebration. Originating in 1940, the Minneapolis Aquatennial is an annual event which highlights the summer activities in and around the lakes and rivers of the City of Minneapolis. Traditionally held during the third full week of July, the Minneapolis Aquatennial is the official civic celebration of the City of Minneapolis, with all Aquatennial events taking place in and around the city. Affectionately referred to as "The 10 Best Days of Summer", its roots extend to earlier civic celebrations, such as the completion of the Stone Arch Bridge in 1883. The modern-day event began when a group of local businessmen decided to develop a celebration which would create an identity for Minneapolis, while boosting civic unity and pride for people of all socioeconomic backgrounds. The nearly 70 events included in the festival are free, including milk carton boat races, sand castle building, beach volleyball, a tennis invitational, a triathlon, and both daytime and evening parades. The Aquatennial features three flagship events: the Beach Bash, the Torchlight Parade, and fireworks on the final night of the celebration. Sponsored by Target Corporation for a number of years, the fireworks display is one of the largest in the country, even larger than those at the Minneapolis Fourth of July celebration. Noteworthy Aquatennial celebrations include the 1956 event, when Minneapolis celebrated its centennial in conjunction with the Aquatennial and the 2008 Aquatennial, a combined celebration of Minneapolis' sesquicentennial and Minnesota's 150 years of statehood. In July 2014, the Aquatennial celebrated its 75th year.